A few months ago, Spirit Beauty Lounge had a flash sale with 20% off everything. After a successful #NoBuyJanuary and a great start at #FrugalFebruary, I felt like hypnotized and the next thing I knew, I put Mun Aknari Nighttime Dream Youth Serum in my shopping basket. If somebody had told me that I’d spend a little fortune over a beauty product, I’d have laughed. But here I am now reviewing this gorgeous serum. I had tried a sample a few months before, and I just couldn’t take it off my mind. So this was a little gift from myself to myself. Turns out, I’m really good at this 😉 From the packaging to the oil itself, Mun N°1 Aknari Nighttime Dream Youth Serum this is simply a dream in a bottle : sweet and soothing. Containing 3 ingredients (Prickly Pear Seed Oil, Argan Oil, Bulgarian Rose Oil) Mun asserts the adage that less is more. It’s all about selecting and combining the right ingredients! The title of the product is self-explanatory: it’s a nighttime serum, Prickly Pear Seed Oil is photosensitive, so it’s not meant to be used in daytime light. I’ve been religiously applying it every night, on a cleansed face, for more than a month. Applying 2-3 drops and gently massaging the face. The texture is extremely pleasant : the serum is quite clear, and super lightweight. Once applied, it leaves a subtle but sweet aroma on your face and instantly soothes and refreshes the skin, without leaving any greasiness. Mun oil works best at night. is photosensitive so do not wear Mun when you will be in daylight sun. Some results were immediate, some appeared overtime. Important: if you’re looking for a serum against spots and pimples, you might want to look for a more specific one! This is not the purpose of this serum. However, it’s absolutely suitable for oily skin – which I have – since it’s not clogging at all. To me, it’s is phenomenal skin replenishing serum! I could immediately observe that it gives the skin a well-needed boost. Stressed and dehydrated skin will immensely benefit from this serum. It also soothes redness as well. After several weeks another difference showed : several scars were fading. I can say that my skin looks more even. It also softens fine lines : some little fine lines around the mouth have diminished. 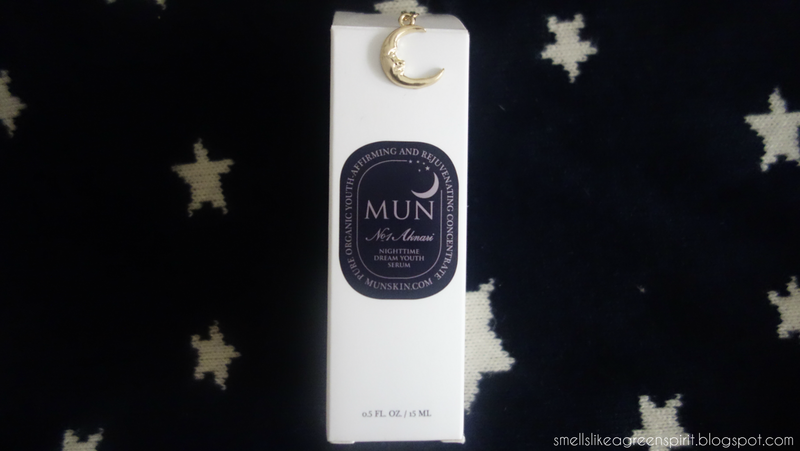 Mun is also gentle enough for the eye area and helped against dark eye circles. If you feel like your skin has been treated harshly lately, the serum will bring some tender loving care to any worn-out skin. have been waiting to try this oil for a good while and finally have! and I would say that this oil is suitable for all skin types. In the morning, skin feels fresh and glowy. And I truly feel my skin more supple. I also really want to emphasize the aromatherapeutic aspect of this serum! An absolute treat for your senses. The scent is utterly divine. I’m at loss for words. For me this is the most exquisite scent, it’s subtle, delicate, fruity, floral, sweet and very refreshing at the same time. I’m not too fond of the scent of argan oil itself, but the combination with Bulgarian Rose and Prickly Pear Seed oil is working superbly. If this was a fragrance, I’d wear this all day long. The scent is soothing and uplifting at the same time and it actually prepares you to sleep. The less sweet aspect remains the price tag for this 15ml bottle. However, keep in mind that a little goes a long way : 2-3 drops at night are more than enough to fully hydrate the skin. I still have enough product left and I have been using it every night for more than six weeks. I also wish the closing system was a bit more convenient, as the cap only covers the slit where the product comes out. I’m always afraid to accidentally press the pump, and subsequently leak some precious drops, while putting the cap back on. Mun Aknari N°1 Nighttime Dream Youth Serum clearly lives up to its name, it is the embodiement of dream. It’s a beautifully crafted product. Instantly soothing, overnight it hydrates and replenishes the skin, giving the skin a dewy appearance. If you are looking to treat yourself, look no further, this is the ultimate pampering product for you! What are your thoughts? Have you tried Mun? What is your favorite luxurious product? Nice review miss! looking like a fab product! Will definitely give it a go at some point (once I need another serum in my beauty cabinet). Really interesting review with some great information Liz! I enjoy your puns and you've got me wishing I could smell the darn serum through my computer! 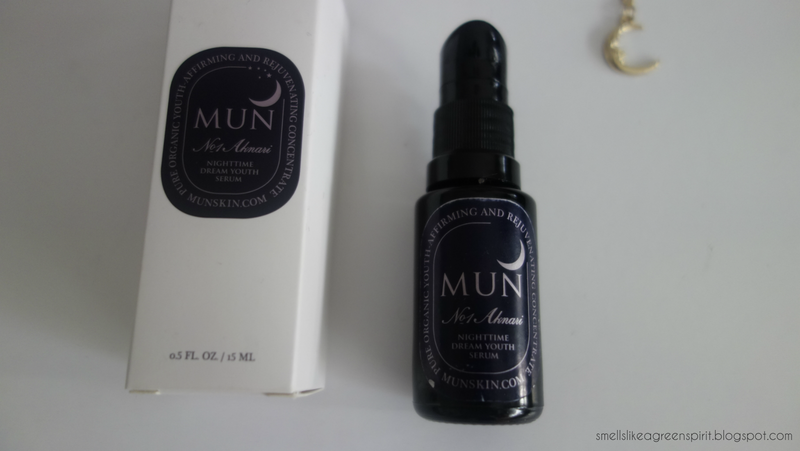 Mun is a favorite of mine, and while it is an investment with cost, great serums are what you're supposed to be investing in. I try others, but I always go back to it. I've also had the chance to speak to the Mun people, and they are also amazing! The product is awesome, the people are awesome how can you go wrong? AAh oui et Liz j'adore le nom de ton blog en passant! Je suis fan de Nirvana 🙂 J'ai écouté les chansons en boucle la semaine dernière 5 avril ..